Sunday Soap Case: Shine Bright with Amibrite! Happy Sunday, Sudsers! It’s June, which is my favorite of all of the months. The sun is bright, the days are long, and there’s no shortage of fairs, festivals, and outdoor activities. 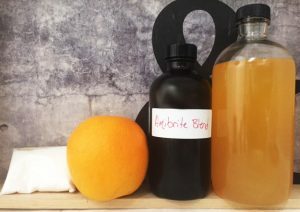 All of that extra time spent outside can result in dry, burnt, tight and weathered skin though, so I thought that today I should do a write-up on my favorite women’s exfoliating and rejuvenating soap: Amibrite. Most of my soap recipes start with the same question: what do I want the soap to do? I always want a bubbly lather that doesn’t take an hour of bar massage to obtain. I always want the bar to effectively cleanse and moisturize without drying the skin (or leaving it greasy, which soap should obvs never do). But after that, then what? 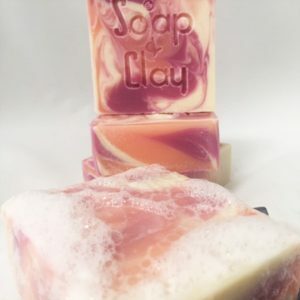 Do I want the soap to polish the skin, to promote cell turnover, to soothe skin conditions such as eczema? After smelling the blend that ultimately went into Amibrite, the answer to all of the above questions was yes. 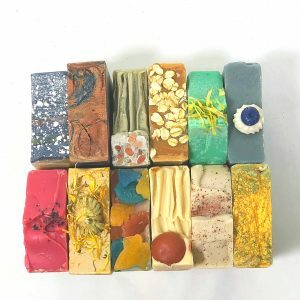 This scent was so amazing that I wanted this bar to do it all. I wanted it to super-cleanse. I wanted it to super-lather. I wanted it to super-moisturize. I wanted it to super-scrub. I wanted it to be super-rific. So I got to work. Rice Bran Oil – as far as skincare is concerned, rice bran oil is an absolute powerhouse. This lightweight, cold-pressed oil is high in Omega 6’s and Vitamin E, absorbs easily, and naturally protects against free radicals and UV damage. Rice bran oil is commonly used in high-end skincare products as it helps keep skin smooth and wrinkle-free. This oil is so effective and so nourishing that it is a staple in every bar of soap found in the Hey, Girl line. 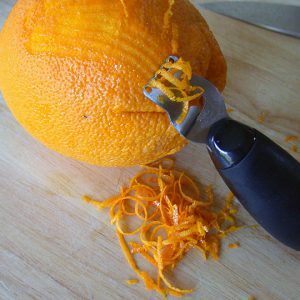 Orange Peel Powder – this antioxidant rich powder is a natural cleanser, promotes cell turnover, fights blemishes, and can help lighten scars on skin from sun damage or injuries (or both, if you’re Mrs. 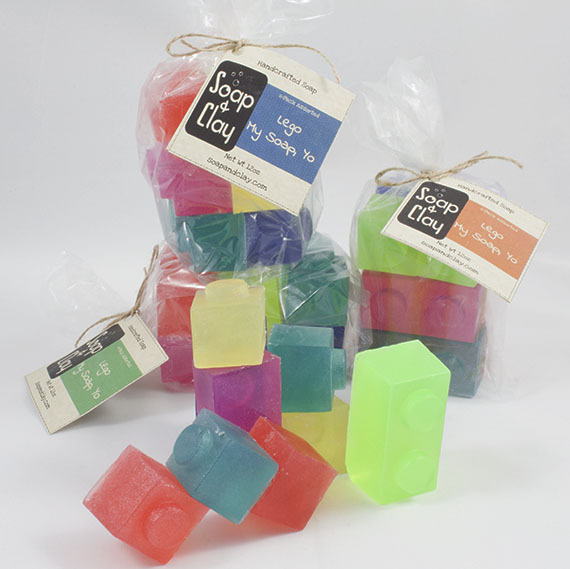 Soap & Clay). It acts as a skin brightener to boot! It’s also a mild exfoliant and has a wonderful citrusy scent. Jojoba Beads – I have been a microbead fan since microbeads became a thing. Every skincare product I purchased had to contain them – until I learned what they were made of, and how terrible they are for our aquatic friends. The jojoba bead is the microbead’s cooler, healthier, sexier cousin. Completely biodegradable, jojoba beads are derived from jojoba oil (another staple of mine in soap recipes), are perfectly round and won’t cause microscopic tears in the skin, making them the perfect scrubby companion. 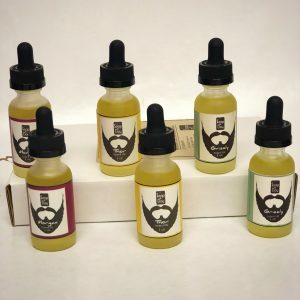 The Blend – this scent blend is my happy. One of them, at least. Bursting with citrusy goodness, this blend contains all of my favorite fruity treats. 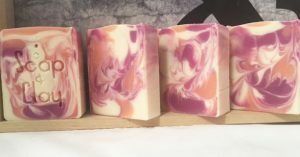 Orange, grapefruit, and tangerine mixes with blackberry and mango and finishes with a warm coconut scent that is just…well, it’s my happy for a reason. It’s bright, uplifting, energetic and all things summer. Once fully cured, the scent reminds me of Nerds candy. Yes, I just provided you a link to buy Nerds in bulk. You’re welcome. It’s Prime eligible! As stated above, this scent is my happy. And sometimes my happy can be…a bit over the top. This pour reflects that manic excited state. Using my two happy colors, I drop-swirl the loaf from staggering heights while employing my very best mad scientist cackle. Then I take a skewer to it while unabashedly belting out Mandy Moore’s Candy loud enough for the neighbors three houses down to hear. And complain about. Because they’re jerks. And because I’m tone-deaf. 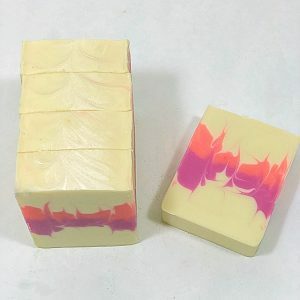 The end result is a bright, beautiful bar of soap with bold streaks of color interspersed with wispy swirls. A pour like this is not uniform; each bar is a bit different than the next. 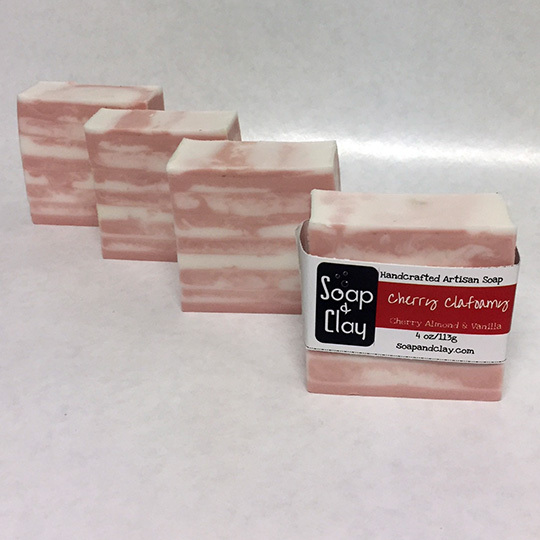 The name dates back to my very first batch of this soap. After cleaning up the soap shop, I called Mr. Soap & Clay in to admire the freshly poured loaf. With a grin on my face and a lye burn on my neck (a story for a later date), I stepped back and allowed him to inspect my handiwork. Before he could say a word, I proclaimed “that ish is AMAZING, amirite?” That was the first time I had ever used the term amirite, so I felt an homage to that moment was fitting. So now that you’re to this point, here’s what you do. Click the link. Add the bar to your cart. Use coupon code LIKEADIAMOND and get a bar of Amibrite on me. Coupon code is valid on all orders between now and next Sunday (June 12th). Happy Sudsing!